My sister and brother in law found this 100 year old sewing machine at a garage sale about 2 years ago and gave it to me to refinish. 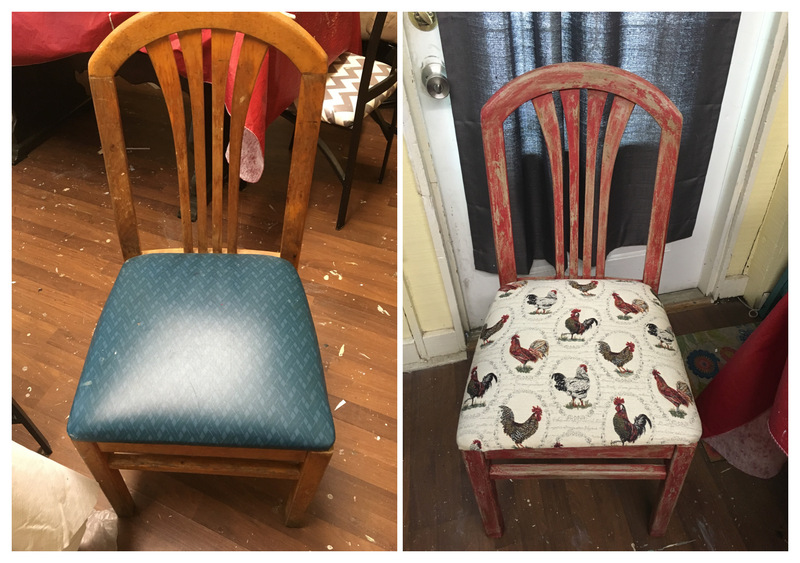 I finally got around to giving it some TLC and some much needed sprucing up. 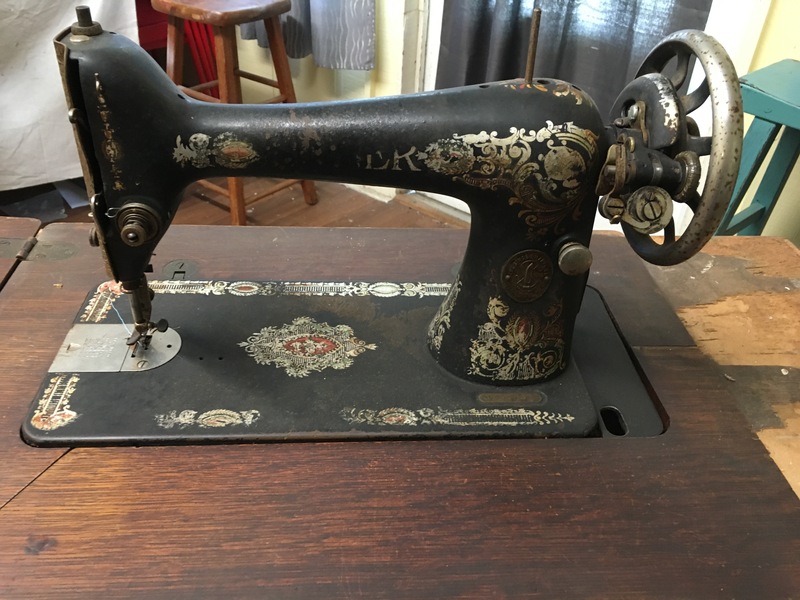 I just love the old pedal sewing machines and I can’t help but think of how exciting it was back then to use one of these for the 1st time. This one still had a lot of the parts, bobbins, etc. 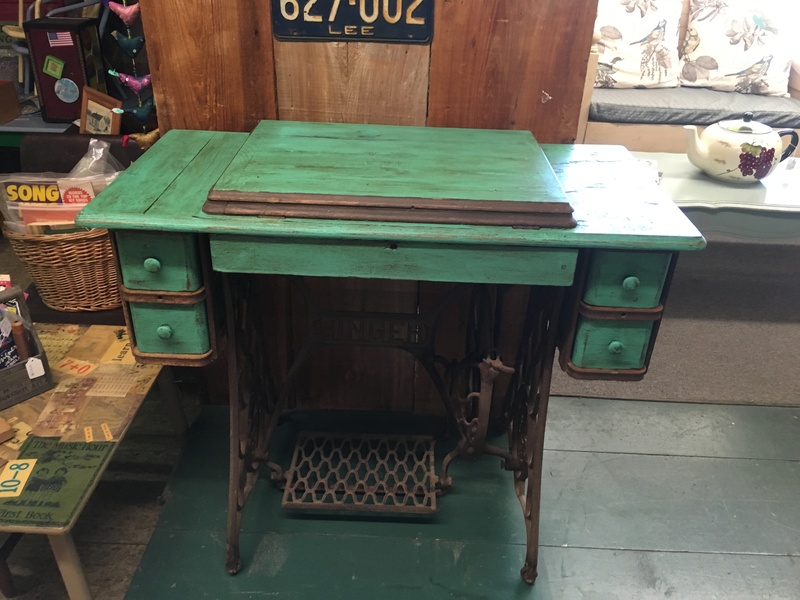 in the drawers and the pedal on the base still works fine but unfortunately the leather treadle belt is not attached anymore. 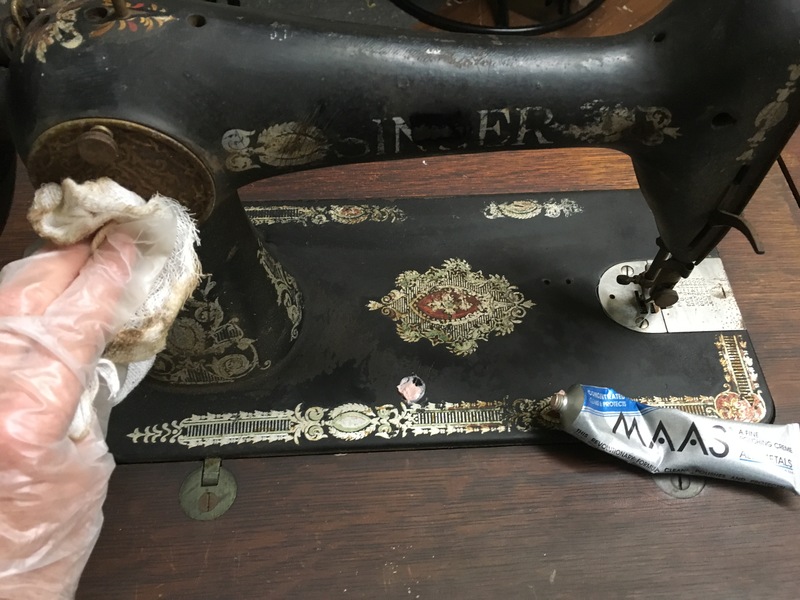 I did not refurbish the sewing machine other than to clean it with some polishing cream. 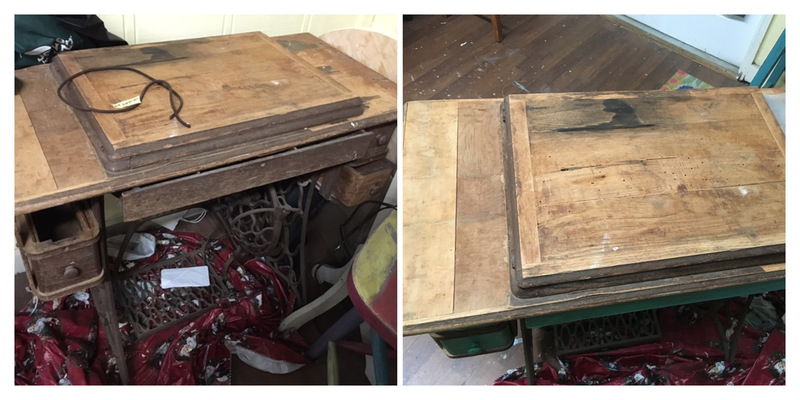 I just wanted to make it presentable where it could be used as a table. My first step was to work on the 4 drawers. 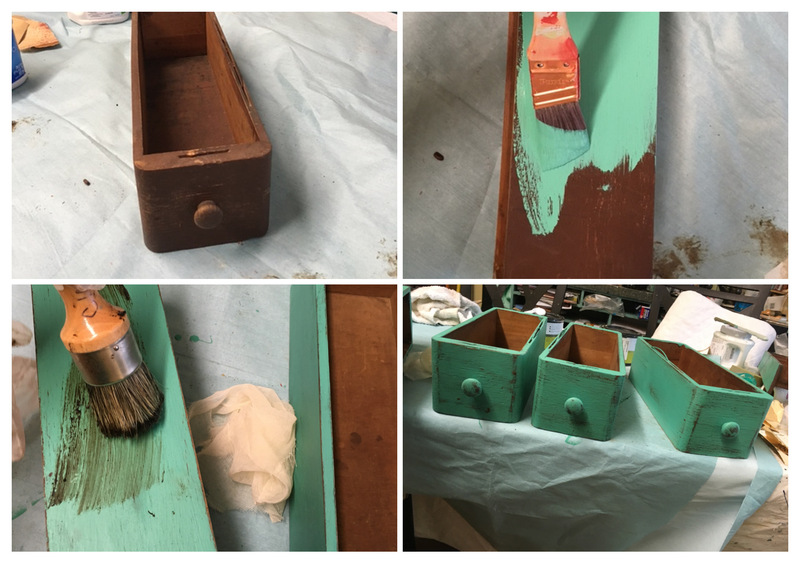 I decided to paint them a light teal color, distress them , and then seal them with a coat of clear wax and then dark wax. 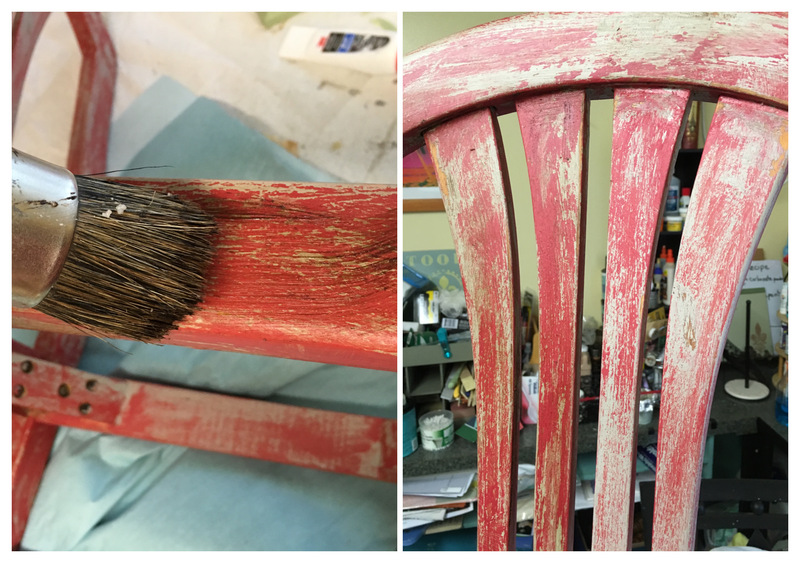 The dark wax toned down the bright color and made it look more natural for an old piece of furniture. When I placed them back in the cabinet I saw how the original wood looked great next to the drawers so I decided to not paint that area. 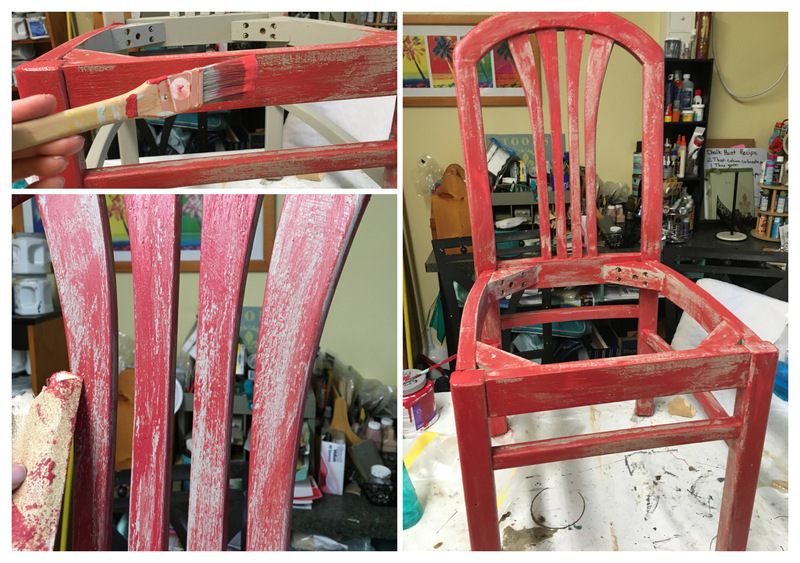 I knew from the beginning that I needed to salvage as much as I could of the original piece. As you can see in the 1st pictures the veneer was missing on most of the top so that part had to be painted. The cleaning of the machine with the polishing cream. I kept the part that folds out to display the sewing machine with the original finish. I refreshed it by staining it with Minwax polyshade. There were some places where I had to scrape and sand the veneer to make it smoother. 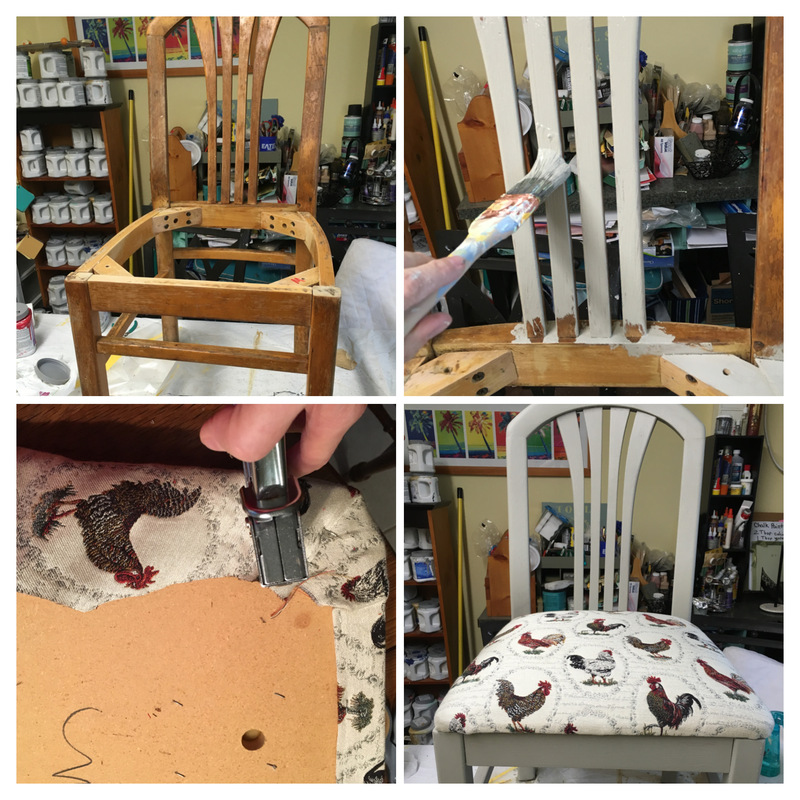 I was not able to get off all of the veneer but I knew it was going to be painted and distressed so I figured it wouldn’t matter. 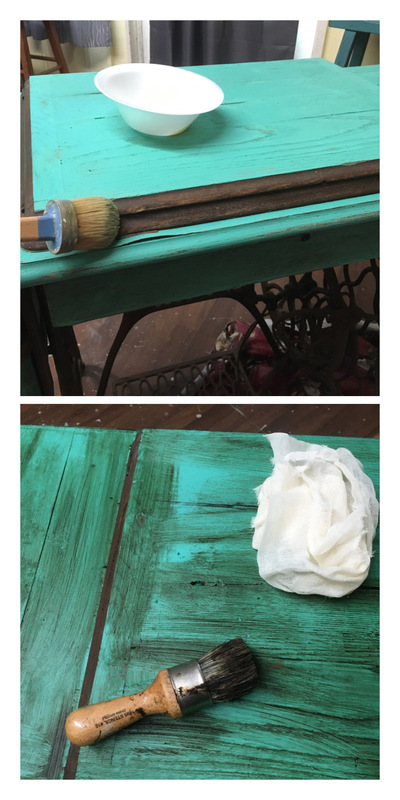 I painted the top surfaces just like I did the drawers, sanded, and then clear and dark waxed. 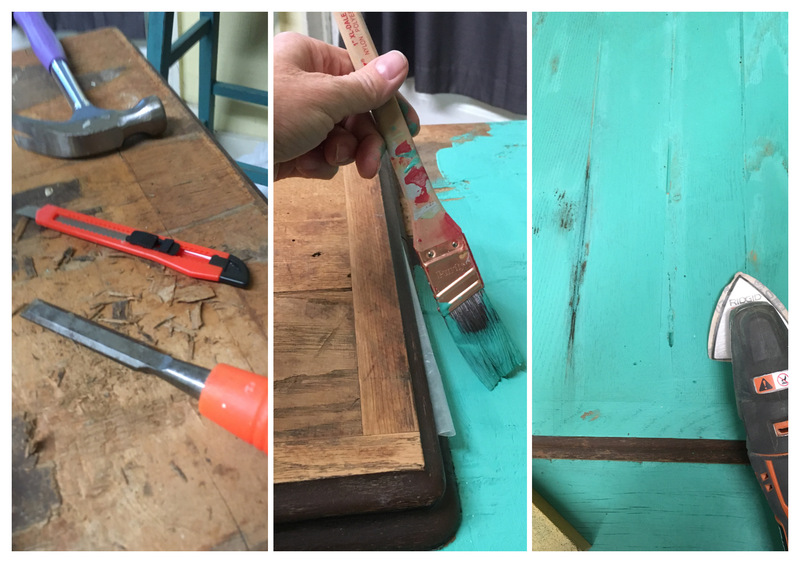 My favorite part was clear waxing on the original wood on the holding areas for the drawers and inside the drawers. It really made a change in the wood and was exciting to see it come to life. Here is the finished project. 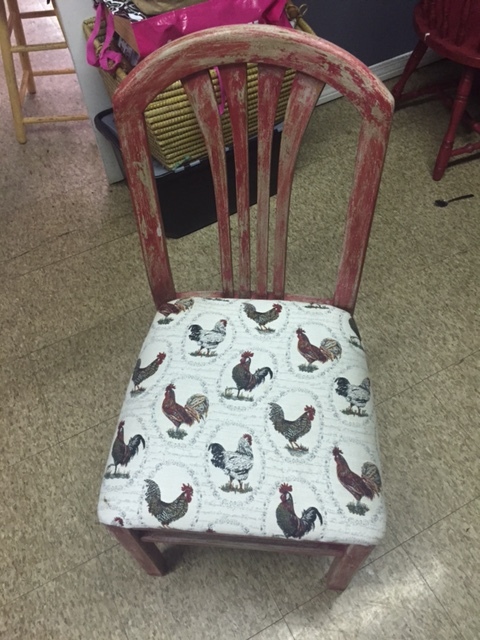 It is now in my shop and I am putting some of my sewing related items for sale displayed on it. 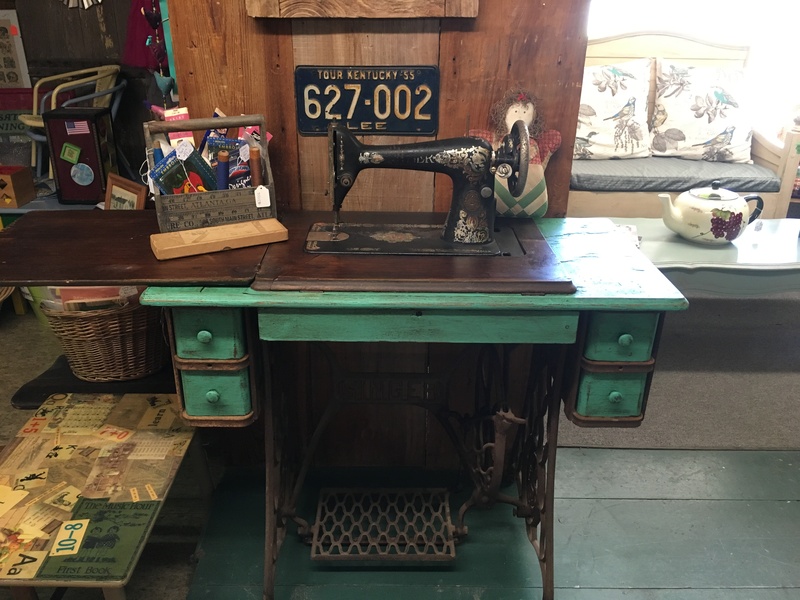 The sewing machine is priced at $120. Update: This sold after being in the shop for only a week.